I love the look of all the frameless mirrors above the daybed. The room looks so relaxing.
! My friend's mom has a vintage version of the dutch elm faux-bois morror (14/21 on the slideshow). It was originally white but she painted it a Prussian blue and it looks amazing in her house. She has tons of mirrors but it was always my fave. I´m from Brazil and discovered this blog by chance(a boring afternoon at work !!! )and I must say I´m addicted...I love the sneak peaks and mostly everything that´s posted here! i've been dreaming up a wall of mirrors hung from picture rail for my new living room, so i find it so wonderfully auspicious that you posted the large photo of frameless mirrors today. quite beautiful! love the work you do for all of us finding and compiling these collections. Mirrors are sensational. 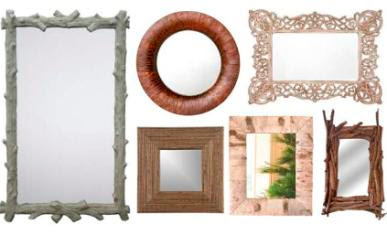 You can find BIG cheap or small cheap mirrors at Ross or Marshalls and recreate the frames. 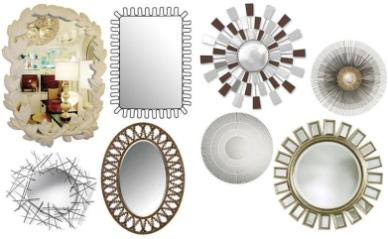 Also you can purchase beveled mirrors of all sizes at hardware stores. I glued the 12 inch square ones in 3 panels of 6 mirrors right on the wall then framed out each set with trim from hardware store which I cut in a hand mitre saw, painted silver and distressed and glued right on wall butted against the mirrors. Looks very french! I'm starting to like mirrors with bamboo frames. In fact, I've used it for my inspiration when I started working on my exotic bedroom. Dark bamboo colors need light, so mirrors were perfect! I opened up the room by putting red silk roses in front of the mirrors. Much better than using pictures all the time. the mirrors above the bed just look great. PS: we really love your selection of items, design sponge! the top image is truly beautiful. Wow - what a collection - thanks for the great article. where can i find this daybed?